Other Products: White Cardstock. Archival ink-orange blossom. 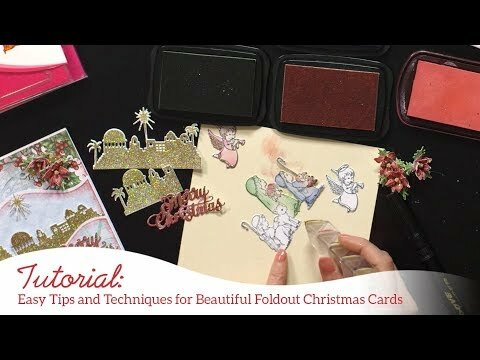 For more tips on creating with the O Holy Night collection, watch the tutorial at https://youtube.com/watch?v=UWDeK6soJ0E. Instructions: Card size 5"x7" and then select pattern paper from the O Holy Night Paper Collection and scrape the edges and then paste them with Designer Dries Clear Adhesive. Next cut two elegant decorative arch shaped die from festive holiday die on white cardstock and adhere on the base of the card as shown. Now cut one delicate decorative eyelet edge from Eyelet Oval & Basics Large Die and one from Eyelet Oval & Basics Small Die as shown. Stamp sentiment from Noel Sentiments Cling Stamp Set with archival ink plum. Adhere these two dies with foam tape to give some dimension. 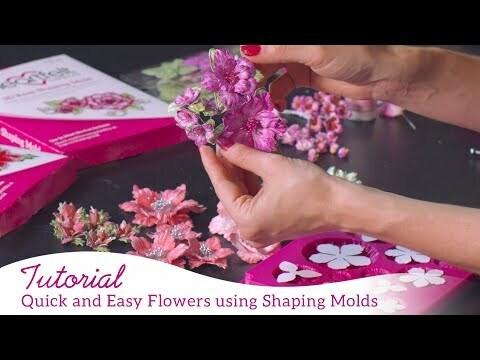 Stamp some Poinsettia & Holly Clusters and cut them with matching die and shape them with 3D Poinsettia Shaping Mold and create some flowers and then adding stamens at the centre of the flowers and sprinkle with some crystal clear glitter. Same steps with sparkling poinsettia flower. Stamp some pinecone accents with archival ink- orange blossom and cut with the matching die from Silent Night Scroll Die as shown, and colour then with leaf green on the edges and sprinkle crystal clear glitter. Assemble the embellishments as shown.